In some ways Roots R&B/Americana singer/songwriter/piano player/guitarist KELLEY HUNT is a rarity and a challenge to the music industry’s penchant for easy artist definitions — a woman who has muscled her way onto the scene on her own terms with an identity steeped in blues/roots/gospel traditions and a refreshing originality. She makes music with it’s righteous roots intact that also crosses boundaries, has an open-minded, exploratory attitude and takes on social and political issues. Together with a commanding, passionate stage presence and superior vocal, keyboard and songwriting skills she has earned the respect of critics and fans across North America and Europe. Born in Kansas City, Hunt’s love for her craft was ignited listening to early blues, R&B, roots rock, jazz and Gospel influences — artists like Ruth Brown, Mahalia Jackson, Billie Holiday, Ann Peebles, Ray Charles, Dinah Washington, Aretha Franklin, Charles Brown, Wanda Jackson and a crossection of the New Orleans/St. Louis/KC piano traditions of Professor Longhair, Toots Washington, Johnnie Johnson and Kansas City masters Jay McShann and Mary Lou Williams among others. Before that came the sound of her mother singing jazz and blues – her first musical memories – and the influence of her New Orleans Gospel singer grandmother. Reminders of these very traditional influences are evident in Kelley’s live performances and recordings but the lyrics, soul and passion are all her own. Her career path so far has been a story of fierce independence, incredible will, unassailable cred as a blistering live performer and hard-won accomplishment. 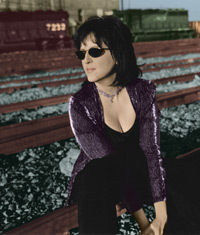 That narrative includes 1500+ performances with appearances on a long list of premier North American and International festival stages, six times on American Public Media’s ‘A Prairie Home Companion’,150,000+ indie units sold on her own label and critical praise reflecting her conviction from the outset to make her path in the roots music world not just as a performer, but as a forward-thinking songwriter as well. That praise continued with GRAVITY LOVES YOU (2011, EER1105): “…(GRAVITY LOVES YOU) sounds like her best yet – which is high praise considering the quality of her 2009 release, MERCY. Hunt’s songwriting shines on powerful, moving compositions like ‘Deep Old Love’, ‘This Fall’, ‘In the End’ and the title cut. And she proves she can shine on the keyboard as well – with dynamic inspired playing throughout” -ST. LOUIS BEACON. “Kelley Hunt delivers the goods with a voice that grafts passionate blues to scorching soul – instantly endearing her to all within earshot, as her band surrounds her in a greasy funk that completes the package and brings you back for more. ‘GRAVITY LOVES YOU’ continues this tasty tradition and ups the ante once again” -Eric Thom BLUES REVUE, SING OUT!, MAVERICK, PENGUIN EGGS, ROOTS MUSIC CANADA. “…Hunt delivers her socially charged lyrics with a voice that’s part powerful gospel yearning and part bawdy soul shouter…” -THE ONION Denver, CO. “Kansas City roots singer Kelley Hunt is equally impressive as a soulful, throaty vocalist and an aggressive, gospelly pianist. She showcases her songwriting prowess on the nicely nuanced GRAVITY LOVES YOU”. -THE MINNEAPOLIS STAR-TRIBUNE. “Blues, R&B singer-songwriter and show-stopping boogie piano player” -OMAHA READER. Kelley Hunt’s new album, “THE BEAUTIFUL BONES” (2014, EER1406), her 6th release and 4th as co-producer and universally hailed by press, radio and fans as the best work of her career, offers a dozen superbly crafted songs that blend timeless music with a contemporary perspective drawing a bead on modern life with grace, humor and gravity through the earthy poetry of her lyrics. All the songs on “Bones” are buoyed by a performing style that balances Hunt’s virtuosity with the down-home gospel, soul and R&B that’s part of her DNA. The title track is a perfect example of Hunt’s art, with its shimmering guitar and B-3 organ providing a gorgeously textured canvas for her haunting, soulful voice. And its storyline is an equally deep illustration of her multi-faceted writing, celebrating both the joy of life and its impermanence, while quietly reminding that the Earth is a delicate and mortal place that must be tended to flourish. The album repeatedly returns to pivotal moments, from the central question “what will we do with this truth and these tears?” asked in “The Beautiful Bones” to, in “Gates of Eden,” the flash when a glance off the road nearly causes a cataclysmic accident to, in “Let It Rain,” the realization that whether we know it or not life truly does give us everything we need. Both heart and soul are in abundance on “The Beautiful Bones”, an evolutionary step in Hunt’s songwriting and arranging. The set’s seamless integration of her influences – from the wooden-church-pew gospel of Mahalia Jackson that resonates in “Release and Be Free” to the classic Memphis soul of “The Sweet Goodbye” to the boogie-woogie of the Tea Party skewering “I’ve Got a Good Feeling” to the driving R&B anthem of self-realization “This Time” – captures Hunt at the apex of her skills, abetted in her performances by the A-team of session musicians she assembled in Nashville’s 16 Ton Studios. Kelley is currently on tour supporting “The Beautiful Bones” through 2016.